Today we begin the countdown of the eleven greatest basketball players to come out of the Greater Seattle area in the past two decades. From 1989 until 2009, we’ve witnessed an explosion of hoop talent emerge from in and around the Emerald City, and it’s time we chronicle the cream of that very impressive crop. First, allow me to define the region of the state we’re examining. The Greater Seattle area extends as far north as Everett, as far south as Tacoma, east to the Cascades, and west to the Puget Sound peninsula. It means a city like Bremerton (home to Marvin Williams) is part of the equation, whereas a city like Mount Vernon (home to Mark Hendrickson) is not. It also eliminates anyone from the east side of the state (John Stockton and Adam Morrison of Spokane), the northern reaches (Luke Ridnour of Blaine), and the southern reaches (Dan Dickau of Vancouver). Second, when creating this list, we’ve taken into account all levels of competition that a player has participated in. If he excelled in high school, but did not play in college or the NBA, then I’ll tell you right now that he’s not on this list. If he excelled in both the preps and in college, but couldn’t make the League, then he’s at an extreme disadvantage. If he played at all three levels with great success, chances are he’s near the top of this list. Third, just an editorial note, we’ve reverted back to the standard three-part format for this Top 11. Numbers 11-7 will appear today, numbers 6-2 on Sunday, and number one in a special feature on Monday. Dickerson, a 6’5″ shooting guard from Federal Way, was one of the area’s brightest talents in the early 1990’s as a prep superstar in the South Puget Sound region. He attended Federal Way’s Decatur High School for one year before transferring to Federal Way High School for his junior and senior years. His greatest notoriety was attained on the summer traveling league circuit, where he was first spotted by University of Arizona head coach Lute Olson. Olson recruited Dickerson and got him to commit to the Wildcats in 1994. At UA, he went from being a lightly-used freshman to becoming the go-to player by his senior season. He also helped lead the ‘Cats to a 1997 National Championship. Drafted by the Houston Rockets in the first round of the 1998 NBA Draft (No. 14 overall), Dickerson was quickly shuttled off to Vancouver in a trade for point guard Steve Francis. Dickerson would go on to be named All-Rookie Second Team in his inaugural season, and finish with a career scoring average of 15.4 PPG before being forced to retire in 2003 after suffering through chronic hamstring and groin injuries. The 6’7″ Webster capped off a stellar high school career at Seattle Prep by averaging over 27 PPG as part of a team with two future NBA lottery picks (himself and center Spencer Hawes) that failed to make the Class 3A State Tournament. To local prep basketball gurus, that may be the crowning glory of Webster’s SPHS squad: their inability to even qualify for the state’s big dance with such a talented group of performers. Undeterred, Webster went off as one of the nation’s best prep talents to participate in the 2005 McDonald’s All-American game. It was there that he sealed his fate as an NBA prospect. Despite a signed letter of intent to play basketball at the University of Washington, Webster instead opted to turn pro directly out of high school following his outburst on the national stage provided by the McDonald’s game. The swingman was selected sixth overall in the ’05 NBA Draft by the Portland Trailblazers and immediately became a fixture in the Blazers gameplan. Unfortunately for Portland and Martell, the rookie failed to catch on in the pros and was later assigned to the the Blazers’ NBDL affiliate in the middle of the season. He eventually worked his way back to Rip City, but now in his fourth season has failed to reach the expectations placed upon him when he was drafted back in 2005. Brooks, a lithe 6’0″ point guard, had a tough time getting attention in his own city while at Seattle’s Franklin High School. The talented Brooks grew up alongside Rodrick and Lodrick Stewart of nearby Rainier Beach High School, and competed for attention, headlines, and wins with his local counterparts. While the Stewart twins paced Beach to the ’03 Class 3A State Championship, Brooks did his part to help his Quakers win the Class 4A State Championship that same year. In an epic matchup of future NBA players, Brooks went head-to-head with Adam Morrison of Spokane’s Mead High School. Morrison ended up with 37 points in a losing effort. Brooks contributed 38 in the win. After his prep days, Brooks spurned the in-state schools and headed off to the University of Oregon. There, he underwhelmed until his senior season, when he finally put himself on the map by willing the Ducks to an Elite Eight appearance in the NCAA Tournament. During his junior year, Brooks was involved in an unfortunate incident in which he delivered a well-placed elbow to the face of Husky guard Ryan Appleby. The cheap shot distanced the Seattle native from a number of local fans and did little to ease the rivalry between Washington and Oregon. Following his senior year at UO, Brooks took the next logical step and entered his name into the 2007 NBA Draft. The former Duck exceeded the projections placed upon him by draft experts and was selected in the late first round, 26th overall, by the Houston Rockets. The first-round selection netted Brooks a guaranteed contract and a role in the Houston rotation. After a quiet rookie season, Brooks has proven himself as a worthy contributor in his second year, coming off the Rockets bench to average double figures scoring in the process. In only his second professional season, Stuckey has a chance of moving up this list in the future. For now, he’ll have to settle for being number eight on our list. Stuckey, a 6’5″ combo guard, attended Kentwood High School in Kent where he led the Conquerors to a Class 4A State Championship in his senior season of 2004. He was heavily recruited by the University of Washington and was prepared to play for Lorenzo Romar until grades interfered with his decision. Because of subpar academics, Stuckey sat out the ’04-’05 season before relinquishing his dream of being a Dawg, instead heading off to Eastern Washington University. At Eastern, Stuckey was an instant sensation. A man playing amongst boys in the Big Sky Conference, Stuckey dominated the competition and put up just over 24 PPG in both of his first two seasons. With the NBA quickly taking note of his collegiate accomplishments, Stuckey opted to declare for the 2007 NBA Draft following his sophomore year. 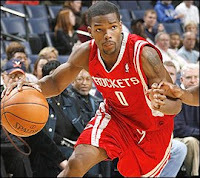 The Detroit Pistons selected Stuckey 15th overall in the ’07 Draft and tabbed him as their point guard of the future. After a quiet rookie season, Stuckey was given greater responsibility this year, following a coming-out performance in the 2008 playoffs. By trading starting point guard Chauncey Billups for Allen Iverson back in November, the Pistons began the transition to the Stuckey era. The second-year player has responded by coming on strong as of late, and hopes to continue that trend as both the season and his career progress. During his high school days, Hawes teamed up with the aforementioned Martell Webster to form one of the most dynamic duos in local basketball history. Unfortunately for the Batman and Robin of Seattle Prep basketball, they couldn’t win a state title together. Doing his best Justin Timberlake impression, Hawes found more success as a solo act, taking home the 2006 WIAA Class 3A State Championship for Prep, while Webster sat on the Portland Trailblazers bench. The following season, Hawes made his way to Montlake to partner with longtime friend Jon Brockman in the Huskies frontcourt. The bona fide center put up decent numbers over the course of the ’06-’07 season, but couldn’t propel the Dawgs into postseason play. Despite a year of unmet expectations, Hawes chose to cut short the college experience and declared for the 2007 NBA Draft. For the third consecutive year, a Seattle product was selected in the lottery portion of the draft with Hawes going 10th overall to the Sacramento Kings. In his second season with the Kings, Hawes has been given an expanded role in the offense with the decline of veteran center Brad Miller and is currently averaging just over 11.0 PPG. 1. He stays and graduates in three years at Washington (Hawes is smart enough) allowing him to play with J-Brock through his whole collegiate career, as well as enter the NBA draft in a sub-bar year, and just do a one night stand with the huskies leading to an STD of no post season play (ala what happened). 2. Says ‘Huskies, I love you guys, you’re my legacy, but I love you too much that I won’t be a one and done player at my favorite school’ and instead chooses Duke, to dominate for a year before heading off to the NBA, still leaving Seattle fans with the fact of ‘hey, he’s still ours…’. I really wanted Hawes to stay but I can’t blame Hawes though. He’d already had to serious injuries before 19 and he was extremely smart to go get his money before something more serious happened. this most recent blog is a good idea. Something that you should probably point out is that most of these players are probably where they are due to the AAU teams set up by George Karl back when he 1st became HC of the Sonics. He was instrumental in getting the greater Seattle metro area “on the map” so to speak as far as the development of amatuer hoop players. I believe it was Karl who first started either Friends of Hoop or Rotory Select – the top AAU teams in the Seattle area. Yet another example that the city of Seattle really was short sighted in letting the Sonics go so easily. I would have to put Stuckey above Hawes, but I’ll reserve judgment until I see the rest of the top 11. I would have probably put Stuckey a bit higher…but great analysis on all of this. Alex can you do a post on the most hideous Pac-10 players of all time focussing largely on Lorenzo Mata-Real? Or an update on your homeboy Serge Angounou! 3G .. Anyhow, good blog!